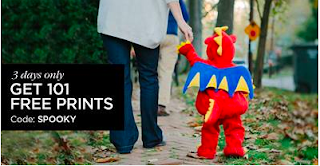 Now through November 1st, you can up to 101 FREE 4×6 prints from Shutterfly.com with promo code SPOOKY at checkout! As usual, the deal is better when you only order 99 prints because you'll only pay $5.99 for shipping which makes it only 6¢ per print! Go HERE to get this deal.